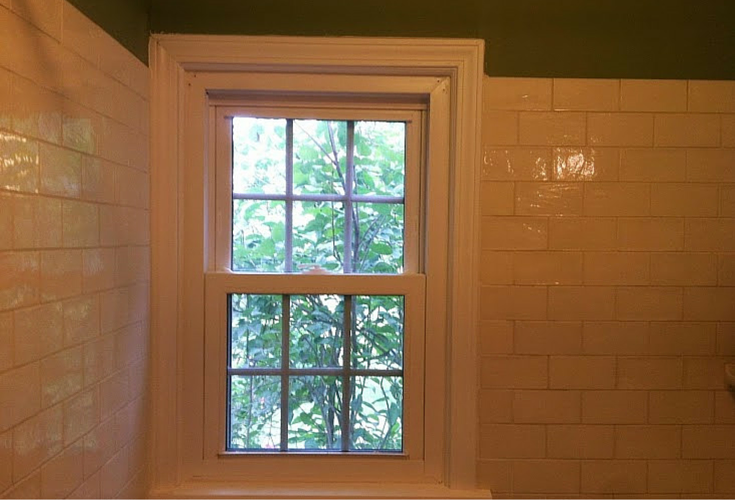 Is the wooden window trim surrounding your shower window rotten and badly deteriorated? If you’re like many people you may be wondering why the heck did they even put wood trim around a sliding or double hung window which is smack dab in the middle of my tub/shower? Constant running water on wood is not a good thing – as is evident to you now! Well – to step back a bit – when many older homes were built the usage of the tub/shower areas was different. In the 1940’s, 1950’s and 1960’s people actually had time to take a bath! Now given our crazy schedules (I’m guessing your life is probably a lot like mine) nobody even thinks about taking a bath. So when you run the shower the water is constantly running off the wood trim of window. Over time the wood has deteriorated and here you are now. 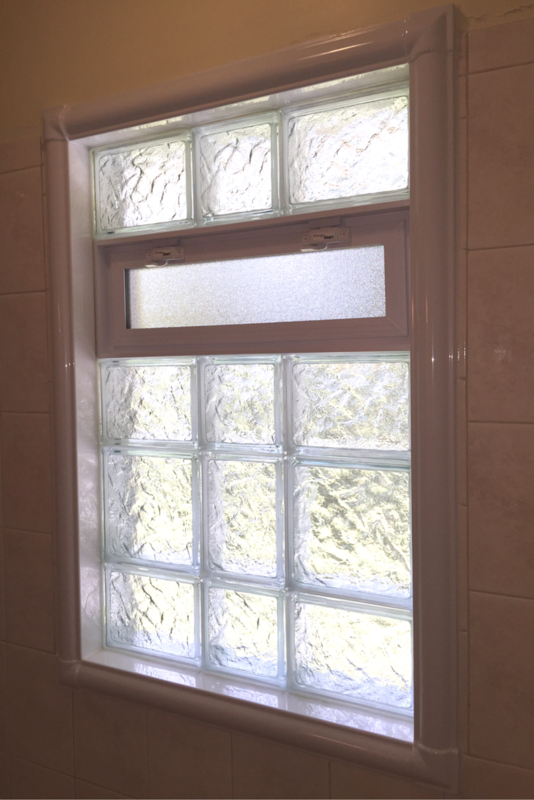 So what options do you have to stop painting (a losing battle) deteriorated wood trim surrounding your shower window? Let’s dive in to take a look at a few proven choices to eliminate this maintenance hassle. If you’re planning on building a new tile shower and have already removed all the trim one sound option is to blow up the trim altogether. 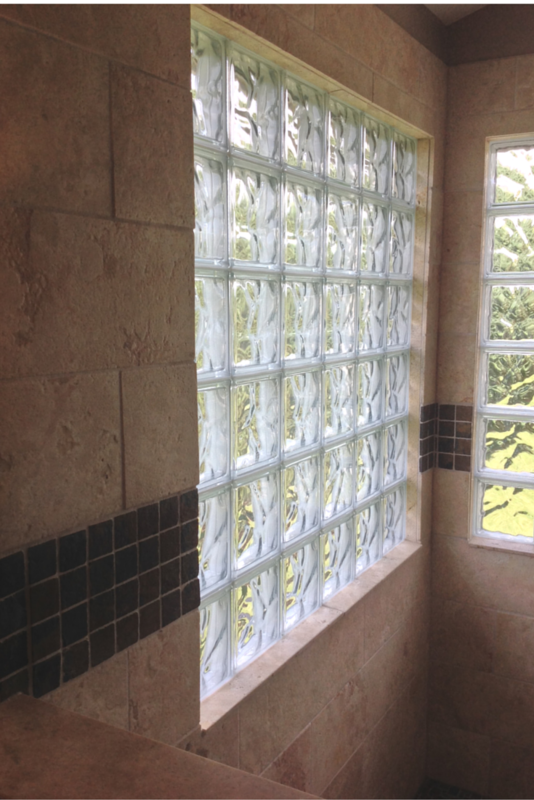 Instead of having separate decorative casing around the window simply run the tile back to your window (note the tile should be installed onto a sound backerboard system like Durock or a waterproof wallboard – like a Wedi or Schluter system). Make sure to pitch on the window sill so the water runs into the shower. The biggest negative with the “tile shower/blow up the trim altogether method” is the challenge (grout joints primarily) associated with tile. Other than the negatives of maintaining tile it can simplify your installation and create a clean look. 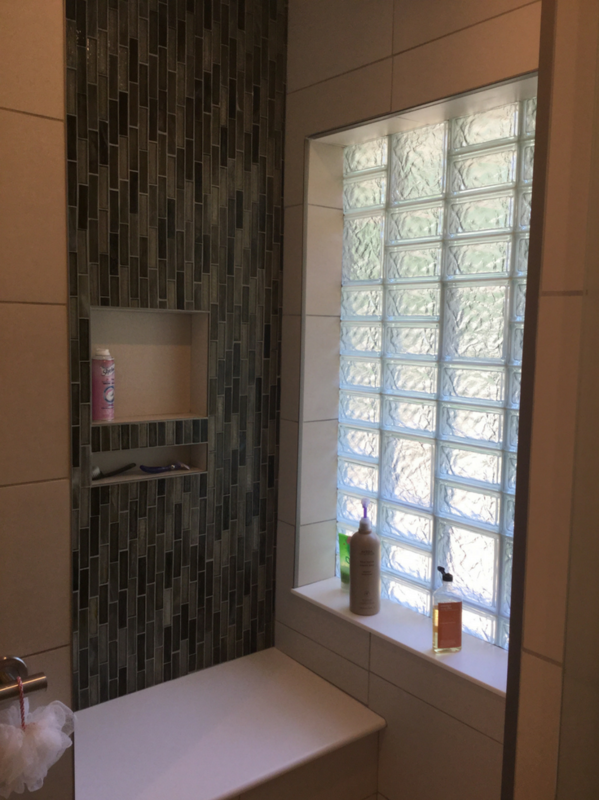 If you do decide to do tile I would recommend going with larger format units (they are in style and they the dual benefit of reducing the number of joints and maintenance hassle – the image above creates this modern look, yet maintains privacy on a first floor opening in a shower). I can tell you firsthand we have seen tremendous growth in our business in the use of solid surface wall panels and the associated trim pieces which go with them. These engineered stone solid surface trim pieces are 100% waterproof, have a wide variety of shape options and come in over 50 colors. Some of the options include flat trim, window trim, chair rail, coved trim and outside and inside corner pieces in different thicknesses. They are easy to cut and give you a finished wood look without the hassle of ever having to paint again. What is really cool is they have a lifetime warranty. You can combine these trim pieces with the surrounding grout free shower wall panels for a completely maintenance free shower. Panels are 3/8” thick and can have stone, slate and subway patterns to retain a traditionally elegant tile or stone look or you can use a smooth or matte finish. You may be asking, “Could I also use products like cultured marble or granite in place of solid surface?” The answer is yes. The only negatives with these products is cultured marble is a bit out of style and granite will be more expensive than the engineered solid surface products. What is nice about the PVC window trim is they have a density similar to wood, are easy to work with and low maintenance. There are several manufacturers of these products – the best known one we have worked with is AZEK. The AZEK material comes in white (it can be painted but I would not recommend getting into that hassle for your shower trim – that’s one of the reasons you wanted to get rid of the wood in the first place!). They are numerous trim profiles in this line and it comes with a 25 year warranty. All in all it is a good material – as long as white trim works for your decorating scheme. You have most likely seen acrylic shower wall panels advertised in community money saver magazines or on TV as a “one day shower.” These panels are a 1/8” thick acrylic which goes over old tile walls and provide a quick fix for nasty tub and shower walls. What you may not realize is you can also get window trim kits manufactured from the same material. These kits come in 14 different color combinations including solid colors, and faux granite, marble and stone finishes. The trim kits are simple to cut, 100% waterproof and will not crack, chip or require painting. They are a sound choice for anyone who would like their trim professionally installed. The biggest challenge for the DIY person is many of the companies who supply and install acrylic wall panels do not want to wholesale these materials to a DIY consumer (this makes it tough to source as a do it yourselfer). 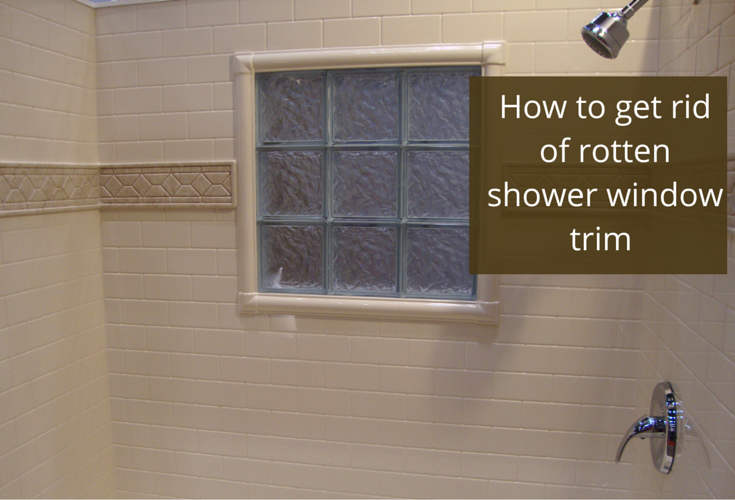 Which of these 4 shower trim options makes the most sense for your project? Please comment or call one of the numbers below if you’re looking for nationwide material supply or a professional installation help (in the Cleveland and Columbus Ohio areas) with these shower trims or grout free wall panels. 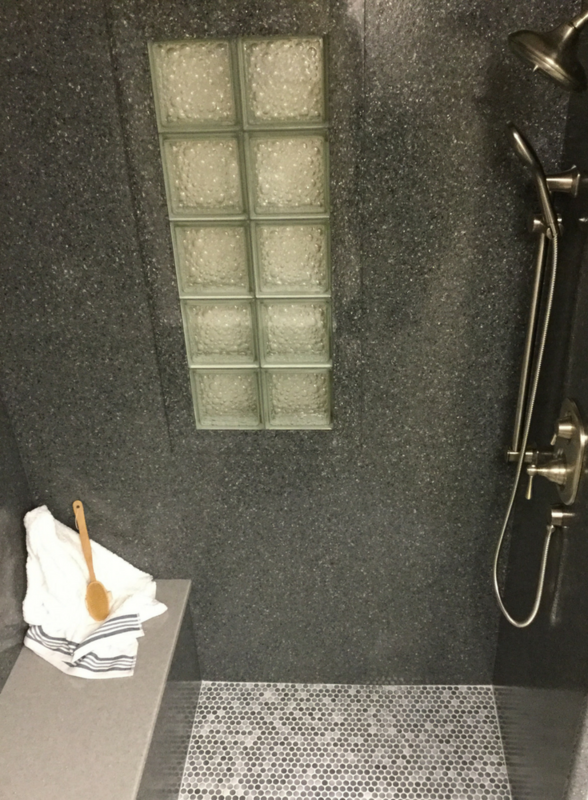 For nationwide material supply for shower wall panels, bases and the window trim options contact Innovate Building Solutions at (877-668-5888). For a Cleveland Bathroom Remodeling project call Cleveland Design and Remodeling at 216-658-1270 or The Bath Doctor in Columbus (614-252-7294). Craig – thanks for your nice comments – glad you like the articles!